Sukamade Beach is the typical beach has been the most visited tourism at Banyuwangi regency for witnessing one of a great natural event of surviving pre-historic turtle reptile can be one great vacation experience in Banyuwangi. The principal object of this adventure "Sukamade Beach Tour Banyuwangi" is watching the typical turtle of Sukamade Banyuwangi to lay their eggs on the virgin secluded beach which is well-known as the Sukamade beach of Banyuwangi. Before You start Sukamade Beach tour, You will go through tropical low land rainforest Meru Betiri National Park, Banyuwangi on the southern coast of Java island. From Sukamade Beach Banyuwangi tour, also possible to walk on jungle road for haft to one hour after long driving from Kalibaru or Banyuwangi to Rajekwesi (Fishermen villages). Taman National Meru Betiri Sukamade, Banyuwangi has been set in the colonial era as one of wildlife reserved in east java is worth to visit during your vacation especially Sukamade Turtle Beach tour in Indonesia. The peak season for green Sukamade turtle (mostly found laying their eggs on Sukamade Banyuwangi) is on the wet season but usually can be found on all year. Sukamade Beach is part on Meru Betiri National Park, it takes about 2-hour driving from the last village by riding a 4x4 jeep. Normal Car (city car) won't be able to get it through, the terrain is very raft, bumpy and need to a crossed river. It could be a very interesting adventure ride the jeep into the last wilderness in East Java. You will see lush jungle with various tree and might be able to catch glimpse of animal (Javanese, monitor lizards, hornbill and more). There is homestay around Sukamade Beach which runs by National Park namely Rumah Kebun and Wisma Pantai. You can not book through online tour provider, only possible through National Park or Jeep provider (the communicate through Radio com). 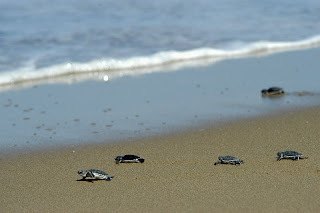 The highlight about Meru Betiri National Park lies on Sukamade beach Banyuwangi, where sea turtle (most common is Green sea turtle) emerge from the beach coming to sore to lay their eggs on the warm sandbank. the turtle laying process on Sukamade Banyuwangi almost happened every night according to the weather, there is no guarantee that we will see sea turtle but most of the visitor said they saw it. After dinner time at Sukamade homestay Banyuwangi, the ranger will take you to shore to experience how the giant sea turtle slowly emerges from the sea, drag her body on a sandy beach then slowly create a nest in the sand. After lied their eggs the sea turtle will bury it and try to camouflage nest to avoid a predator. Right after ranger will dig the nest and replace all the eggs to man-made hatchery (it sound to disturb the natural process, but through this human intervene help sustainable population growth). We can help all the process till releasing hatchlings to the sea. Visiting Meru Betiri National Banyuwangi, might be quite pricey specially Sukamade beach tour, because the Sukamade Beach tour package Banyuwangi already completed with the facility like special ranger to guide the turtle exploration, private jeep to take You for 2 ways (start and comeback from Banyuwangi City), 1 night homestay included dinner and night adventure to find the turtle laying egg. But it is really worth to visit when You see the sea turtle activity while also could visit the Green bay along the bay. The nearest way to enjoy the Sukamade Beach Tour Banyuwangi, You can start your tour from Banyuwangi Port, Hotel or Train Station. For more information about Sukamade Beach tour price, You can visit Our Contact.